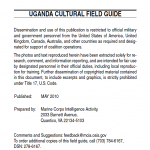 The Uganda Cultural Field Guide is designed to provide deploying military personnel an overview of Uganda’s cultural terrain. In this field guide, Uganda’s cultural history has been synopsized to capture the more significant aspects of the country’s cultural environment, with emphasis on factors having the greatest potential to impact operations. 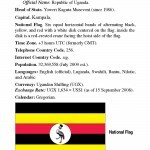 This handbook provides basic reference information on Uganda, including its geography, history, government, military forces, and communications and transportation networks. This information is intended to familiarize military personnel with local customs and area knowledge to assist them during their assignment to Uganda. The Lord’s Resistance Army Disarmament and Northern Uganda Recovery Act, Public Law 111-172, requires the Secretary of State to submit a report to Congress on implementation of the President’s strategy to support disarmament of the Lord’s Resistance Army (LRA) and assistance provided toward a lasting solution to the conflict in northern Uganda.